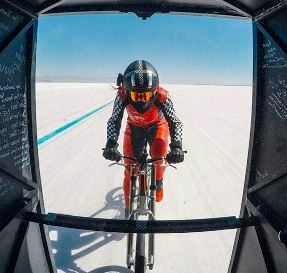 Denise Mueller-Korenek, a 15-time bicycling USA National Champion, became the fastest human on a bicycle Sunday when she was clocked at 183.9 mph on the Bonneville Salt Flats in Utah. Mueller-Korenek, 45, shattered the existing motor-paced cycling land speed record of 166.9 mph previously held by Dutch cyclist Fred Rompelberg in 1995. Riding a special (carbon fiber) bike with two chains, Mueller-Korenek was towed behind a dragster driven by Shea Holbrook until reaching 150 mph at the two-mile mark of the five-mile salt flats course, according to the Wall Street Journal. Then she released the cable tether and pedaled the final three miles under her own power but behind the dragster’s “slipstream” as Holbrook accelerated to 184 mph. Read more…..